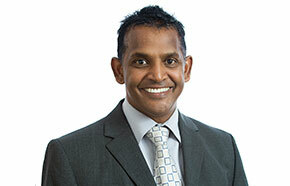 Local GP Dr Prag Moodley is the new chair of East and North Hertfordshire CCG. He was elected to the role at the May meeting of the Governing Body and takes up the post in September. Dr Moodley is GP lead for the Stevenage locality and the CCG’s mental health and learning disability lead. He has been a GP for over 20 years and working in Stevenage since 2004. He succeeds Welwyn GP Dr Hari Pathmanathan, chair for the last four years, who is taking on the role of Medical Director of Hertfordshire Community NHS Trust, in September. “Our CCG was judged ‘outstanding’ last year and I am looking forward to continuing the good work and momentum achieved under Hari’s leadership,” said Dr Moodley. CCG Chief Executive Beverley Flowers said: “I am sad that Hari is leaving the CCG’s governing body, but very pleased that we will continue to work with him in the wider health system. Under Hari’s chairmanship the CCG has grown in strength and confidence, as reflected in our assessment as an outstanding CCG by NHS England. I look forward to working with Prag and bringing forward new ideas to improve the health and wellbeing of everyone who lives in our area. Dr Nicky Williams will continue in her role as the CCG’s deputy Clinical Chair.